ADDIS ABABA , Sep 28 2013 (IPS) - Strong action now expected against the al-Shabaab group may well end up strengthening the group rather than weakening it, local people fear. The extremist group is suspected of involvement in the attack on the Westgate mall in Nairobi. 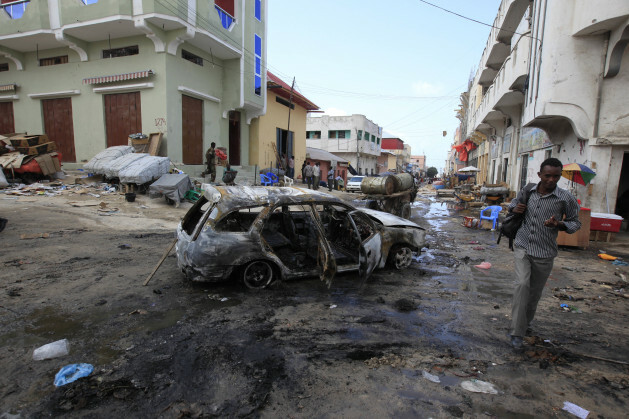 The Islamist group had been on the back foot in Somalia for some time. It faced dwindling support in recent years from an increasing disenfranchised diaspora and from a Somali population growing increasingly tired of violence. Several signs have emerged of a weakening of the group. In recent months, al-Shabaab was kicked out of Bakara Market and Kismayo port in Somalia. These were two strategic locations for the group, and huge sources of their income. Despite an increase in the murder of journalists and bombings in the capital, a serious attack on the national courts and on the UNDP compound in Mogadishu, many analysts had been pointing to a diminishing al-Shabaab. The Somali Transitional Federal Government (TFG) had been heralded for bringing in a new era of stability for Somalia which saw diaspora returning and restoration of a certain degree of normality. The attack on Westgate could seek to draw strength from its growing weakness. The group could capitalise on the reasons for its origin. Following the U.S-backed invasion of Somalia by Ethiopia and an African force in 2006, the Islamic Courts Union (ICU) that had been dominant in ruling Somalia was driven out of the capital. A youth wing of the ICU took up arms against the “invaders”. The group, known as al-Shabaab, or ‘the youth’, continues to fight foreign forces. After Ethiopia sent in significant forces against it in 2011 to bolster Kenyan and African Union troops, al-Shabaab has faced several strategic setbacks. These led to infighting between leaders of the group. It is believed that some leaders were concerned that others were becoming too involved with the global jihadist movement and al-Qaeda. Al-Shabab leader Mukhtar Abu Zubeyr, known as Godane, took over supreme leadership this summer, knocking out the more moderate leaders. He has frequently voiced his loyalty to Osama bin Laden and al-Qaeda. According to Hansen, Al-Shabaab may have attempted to take advantage of the Somali people’s increasing hostility towards Kenya’s support of the Ogadeni clan which dominates Juba state. The state has seen a strong move to secede from Somalia with Kenyan support. Somalia expert Alula Iyasu said that the government in Mogadishu needs to be careful how it responds. “While the law and order aspect is critical, the worst thing Mogadishu can make is to think, like the Bush administration did, that terrorism is the work of a finite number of bad people and if you arrest or kill all, the problem goes away. Not the case,” Iyasu told IPS. The Westgate attack will serve as a warning that al-Shabaab, despite recent setbacks, is able to launch more terrorist attacks and to do so beyond Somalia’s borders. Now that the group has shown a stronger alliance with al-Qaeda, many diplomats are concerned Westgate might just be the beginning of a spate of attacks.